The rib roast comes from the section between the chuck and the shortloin. On one end is the chuck, and on the other is the new york. It consists of 7 ribs (used to be 8, until the packing houses realized they could get more money by leaving that rib on the shortloin, which sells for a higher price). As it runs from the chuck down, the diameter thins – a 3-rib roast cut from the chuck end will have a dramatically different look to it than a 3-rib roast cut from the loin end. 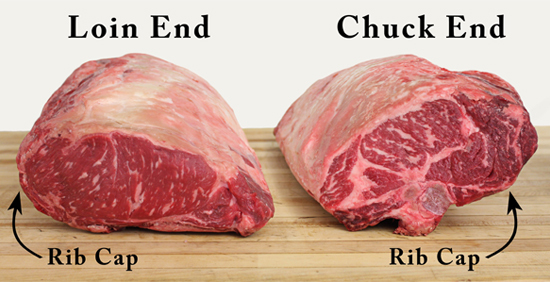 Each end will have its different advantages – the chuck end has a higher percentage of rib cap, while the loin end will have less internal fat. These are two ends of the exact same piece. You can see how the rib cap starts heavy on the chuck end, but it thins out to a barely percetiple edge on the loin end. The rib roast is hands down the most dramatic of all roasts, and the most traditional holiday roast. An entire 7-rib roast will weight between 16-17lbs, and will serve approx 14 people, which is more than you can get with any other single roast. On the flip side, because of the large diameter of the rib roasts, each slice will be a little more difficult to portion for some of the smaller eaters. Additionally, it can be slightly tricky to carve the bones. It also has the longest cooking time. If you know a rib roast is right for you, you’ll want to figure you need approx 1lb of roast per every serving. Another way to look at it is to figure 2 or 3 people per rib, depending on appetite. For any of you who aren’t getting your roast from us, we’ve got words for you. But not the kind you might be thinking – here are some great tips if you’re buying your roast local. 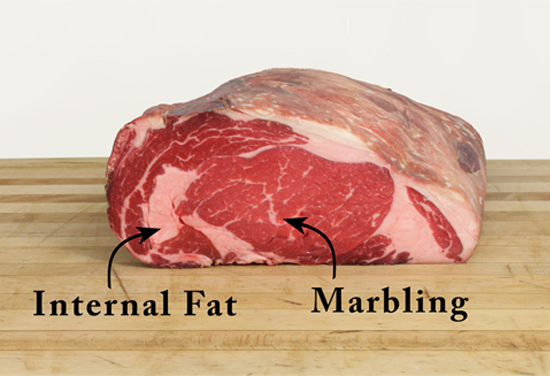 If you can’t find any Dry Aged rib roasts, the next mot important thing you want to look for is the marbling. A great piece of meat has fine flecks of marbling running through it, try to avoid pieces with very heavy chunks, as this results in an uneven eating experience. If any of you are heading to Costco type stores to get your roast, you’ve got a good chance of finding a decent piece if you know what to look for. Check out the marbling from the loin end of the rib (that’s going to be the end that looks ‘flatter’ than the other end). If you use your finger to carefully stretch out the plastic packaging, you can get a better look at the meat itself, and how good the marbling is. Right where the rib roast stops is the start of the Loin, where the New York is cut from. If you think of a Rib Roast as a bunch of bone-in ribeyes stuck together, the Club Roast is a bunch of boneless new yorks left together. 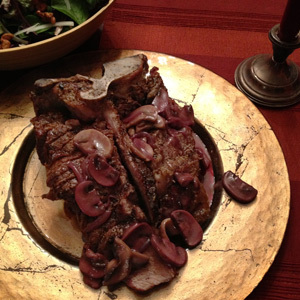 Unlike the rib roast, the entire new york strip does not change too dramatically from one end to the other. You will not have a significant visual or taste difference between one end of the club roast versus the other, it’s a very uniform piece. You can see that there really is very little diameter difference between one end of the New York towards the other. 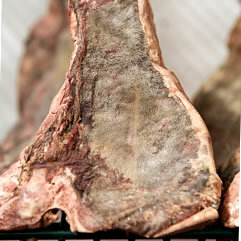 This particular piece is untrimmed; apart from more trimming needed from the Sirloin End, both sides are ver similar. I know it’s going to sound crazy, but I honestly can’t think of any serious cons to the Club Roast. Probably the only thing would be that the presentation isn’t as dramatic as a rib roast, but apart from that, it’s a phenomenal cut. When slicing, you will get consistently uniform portions, and there aren’t any bones to carve around. Each slice will run approx 8-10oz, giving you very versatile portions. Another great aspect of it is that all of the fat runs along the outer edge, you won’t run into any internal fat on this piece. 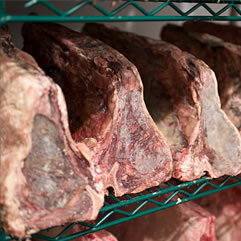 The cooking time is quicker than a rib roast, but slightly longer than for a tenderloin roast or rib cap roast. When ordering, figure that you’ll need about ¾ of a pound per serving. The key to the tenderloin roast is right in its name – “tender”. Hands down this is the most tender of all roasts, and all steak cuts for that matter. Nestled next to the New York, the key to what makes the filet so tender is that it is a muscle that is mostly unused during the life of the animal. 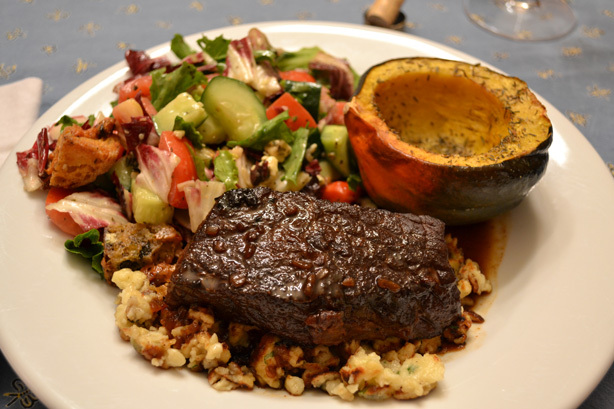 Because we all know it’s impossible to have it all, the tenderloin roast does have some shortfalls. This roast will have the least amount of flavor of all other cuts. Being such a lean cut, there isn’t enough fat to really inject it with the decadent flavors you’ll find on the Rib Roast or Rib Cap. Because of this, the tenderloin roasts act as a fantastic blank slate for any accompanying sauces. This lack of fat is seen as a significant “pro” by many people, however. The smaller diameter to this roast will allow you smaller portion sizes when sliced. 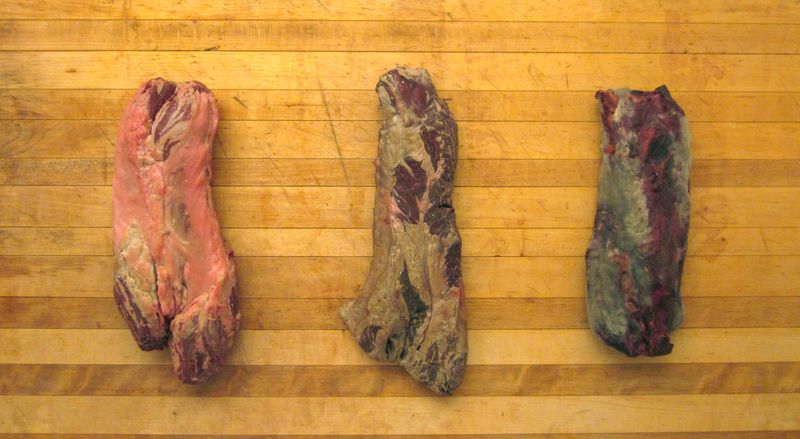 A slice from a tenderloin roast will weigh approx 4-6oz, versus the 12-16oz portion you’ll see cut from a Rib Roast. It will cook faster than other roast options requiring only 35-45 min in the oven. You won’t run into any lost weight from bones or fat on this roast, so it’s safe to assume you’ll need ½ pound per serving. We do a lot of talking about the Rib Cap around here, and with good reason. I’m convinced that the rib cap is without a doubt, the single most flavorful cut of meat. 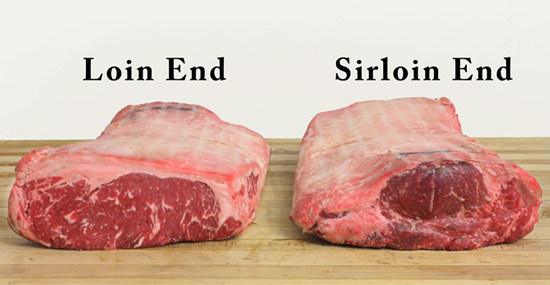 Officially known as the “Spinalis Dorsi” muscle, the rib cap is the outer ‘cap’ that sits on the prime rib. As it runs from the chuck end of the rib toward the loin end, the thickness of the muscle tapers from approx 2” thick to a point. In order to give the cut a uniform thickness, which you need for proper cooking, we roll the cap and tie it with butchers twine. After cooking, you’ll cut the twine and slice to serve. 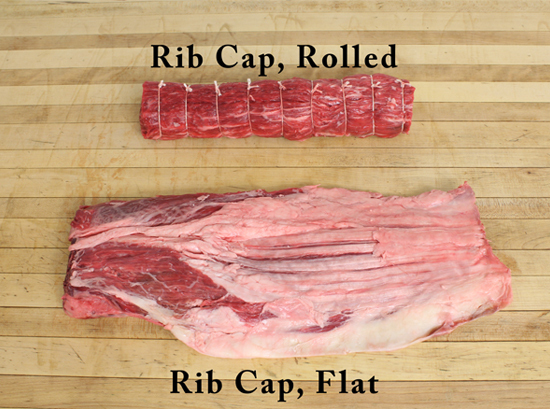 The "Flat" Ribcap is what the cut looks like when it is pulled off the rib. You can see the heavy layer of fat towards the Chuck End (on the left). There is also a lot of sinew that gets removed before it is rolled and tied into the Rib Cap Roast. The obvious pro here is flavor. Followed by more flavor. If you’ve got anyone coming to dinner who claims to know what phenomenal beef tastes like, serve this. The Rib Cap Roast has a similar shape to the Tenderloin Roast, so the cooking time will also be a manageable 45min or so. The cons to this cut are that some people find it too rich (I’ve tried referring those people to psychiatrists to no avail), and the presentation isn’t as elegant as a Tenderloin Roast or Club Roast. 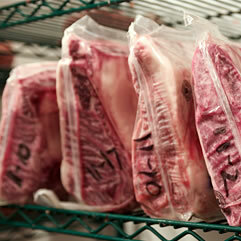 The crazy tip that we give to anyone going with the Rib Cap is to overcook it. Now hear me out first. The cap has a very unique texture, unlike any other cut. Being so rich, it is softer than the heart of the ribeye, or a new york. To avoid it retaining too much of that soft mouthfeel, you want to cook it past rare, and go into medium well done terriorty. Once here, the texture firms up, and you enter a fifth dimension. Seriously, trust me on this one. Most prefer to sear this roast to give a good crust, but it will also be sperb without searing. You’re going to have the same basic info on the boneless ribeye roast as you have on the traditional rib roast. The obvious difference between the two is that the ribs are removed from this roast. This section will also be similar to the rib roast. Depending on who you ask, it could be either a pro or a con that the bones are removed from this roast. While I disagree with the notion that the bones impart flavor during cooking (unless you’re braising, but I can get into that later when we focus on short ribs), I personally love having the bones to gnaw on. When the wife’s not looking, of course. The same cons will exist – you have the most amount of internal fat with ribeyes. This shows the middle of the Ribeye - you can get a better visual here of what we mean when we refer to the internal fat of Ribeyes/Rib Roasts. If you're looking for both the benefit of a Boneless Rib Roast as well as having the bones to chew on, we've got you covered - have the ribs removed and tied back on. We’ll be happy to do this for you or if you are shopping locally, ask your local butcher to do this for you (just don’t tell them it was our suggestion…they’ll hate us for it). For those of you who have ever struggled when carving the cooked roast, this is the answer. When done properly, you can’t even tell that the ribs have been separated. The cooking process will be exactly the same and there will be no loss of juice because the ribs are seating back exactly where they were and will seal the roast while cooking. When done, simply cut the strings and lift off the meat… Voila! you have a boneless roast to slice and the ribs will be fully cooked and servable if desired. You will also find that you can get even more servings when the roast is prepared this way. Simply purchase a traditional Rib Roast, and leave us a note in the comments section during checkout that you'd like the bones removed & tied back on. To play our part in the upcoming Father's Day event, I'm introducing three new products (Porterhouse, Filet Steak, and Filet Roast) that retain a heavy amount of outer suet, a magical fat that melts when cooked and brings a level of flavor you've only dreamed about to the table. And in doing so, I wondered why all the fathers out there weren't already clamoring for such a thing. Both "fat" and "father" begin with the same 3 letters, "f-a-t". Obviously there is a bond there, so then why the aversion to fat? The answer to that lies in the last 3 letters of "father"... "HER". She's the one standing between a father and his fat! Dads of the world, unite! Have your fat! Put your foot down, this is your day! What better way to celebrate than to reconnect with that subconscious primordial call of the fat? It's been a helluva of year for us, and we've got our customers and fans to thank for it. We've spent much of the year aging, cutting, and trimming some of the best darn beef in the country, though it's kept us off our computers. On the other hand, this is a good thing - have you ever seen what ground beef can do to a keyboard? Now one of the downsides to keeping our noses to the grindstone, (or grinder, in our case) is that we're always the last to know how much people like us - regardless of the fact that we're horrible at answering the phone. We've managed to attract a bit of attention in the media this year, and we want to share it here so that at least it looks like we're on top of things. 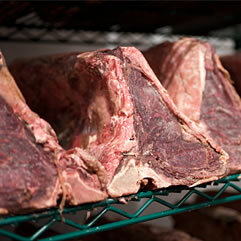 A5 Wagyu Beef vs. Flannery 'California Reserve’ Beef - F. Martin Ramin/The Wall Street Journal. "6th Course: Côte de Boeuf Flannery dry-aged ribeye, with Amish butter, matsutake and potatoes à la grecque, grits, pesto of garden trimmings. (Joshua McFadden & The Restaurant at Meadowood)"
Lastly, if you get a chance to see us in Esquire Networks new show called "The Getaway”. They filmed an episode in Napa Valley, and featured PRESS and our friend Trevor Kunk. With February 14th just around the corner, here are some of our favorite options for a romantic dinner, along with some quick cooking tips to keep the lovebirds in the kitchen. Without a doubt the perfect sharing steak, but while bringing some fun to the table as well. Cut from the short loin, it contains both a Filet Mignon and a New York Strip steak, joined by a bone. 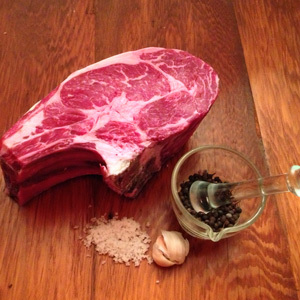 Hearty, dramatic and versatile, a Porterhouse steak offers an experience in exploration of texture and flavor. Cooking Tips: Sear both sides of the steak, then transfer to a preheated 350 degree oven for approx. 20 minutes. Using a cast iron skillet to sear will give a more dramatic crust to the finished product, but a Teflon pan works well too (and if you’re a guy, it’s easy to clean!). A neat trick for serving is to use a thin knife to scribe each side of the bone and cut each piece off, then slice into 1.5” thick portions and reassemble on the bone. The gold girl standard in tenderness, Filets are a great option for special occasions (and if you put two side by side and squint your eyes it almost looks like a heart… according to Bryan). For those who like to cook, the relatively small portion size of the filet allows room for plenty of other side dishes. 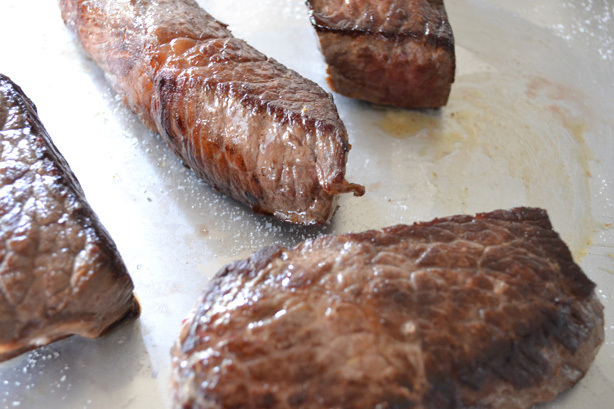 Cooking Tips: Heat a pan to medium-high with a little oil (you want it hot, but not ‘sear’ hot), then cook the filet(s) for 6-8 minutes on the first side, then finish with 2-3 minutes on the second side. If you’re worried about too much smoke in the kitchen, try using grape seed oil instead of olive oil. For the true ‘steak lovers’ out there, the “Jorge” Ribsteak is the ultimate in great beefy flavor. For anyone who wants to surprise their sweetie with a giant hunk of meat, this is the way to go! Cooking Tips: The Jorge will have a similar cooking method to the Porterhouse steak – sear first on the stovetop, then finish in a 350 degree oven for roughly 25 minutes. To serve, slice the meat on the bone. Start at the opposite side of the bone, keeping your cuts parallel to the bone. Eventually you’ll have to scribe along the bone, but you’ll have cut the majority of the steak before that. Another great option for Valentine’s Day, a classic rack of lamb is a relatively easy dish to prepare that never fails to impress. Throw the rack in the oven, toss together a quick salad along with some crusty bread, and voila! The perfect romantic dinner. Cooking Tips: Place the rack in a preheated 400 degree oven for 45 minutes, it’s that easy. This cut can also be a great opportunity for experimentation – a mustard/herb coating will give restaurant worthy results at your home dining table. When carving, keep in mind that this is a slight curve to the bones, so you won’t want to slice directly down between the chops. Slice with a small ‘arc’ motion to follow the natural contours of the bone, and make serving a breeze. Shazam – we were all of the above way before our time!! Obviously we’re dating ourselves here, so it makes sense that our first post will be about, you guessed it, age. But in the interest of keeping it relevant, we’re only going to post something when the odds are it is meandering, blatantly uninteresting, and borderline stupid. But we need friends. Next we’re going to figure out how to get you to ‘like’ us on Facebook.